I was very fortunate to be invited to present a workshop on how Student partnerships are driving institutional change at the UUK Enhancing the Student Experience conference. This was an opportunity to present the findings from our Digital Student project as well as the outcomes from our Change agents’ network which has been supporting student staff partnership working as a vehicle for driving forward change on technology related curriculum projects. You can view the Storify summary of tweets from the event here. The audience included vice chancellors, pro-vice chancellors, dean of students, student experience managers and registrars. It was an opportunity to engage senior leaders and to hear their views on partnership working as an approach to enhancing the student experience. The opening session, included presentations from Polly Payne, Director of Higher Education, BiS, Megan Dunne, President of NUS and Professor Cliff Allen, Vice chancellor of Birmingham City University. We heard from Polly Payne outlining the HE Green Paper: Fulfilling our potential: Teaching Excellence, Social mobility and student choice, and the plans for consultation. There were many questions from the audience on metrics and how you measure teaching excellence. The outcomes of recent QAA reviews was given as a starting point to which other metrics will be added. Concerns were raised over the links with increasing student fees and this was followed by a powerful address from Megan Dunne, President of NUS. • See NUS Comprehensive guide to learning & teaching with useful benchmarking tools for assessment and feedback, learning resources and personal development planning. Professor Cliff Allen, Vice chancellor for Birmingham City University, outlined how student engagement and working in partnership with students was embedded throughout the core business of their university. Students as Academic Partners Scheme, Students as Academic Mentors, OpportUNity Student jobs on campus and BCU Graduate + are some of the initiatives in place where students are working in partnership. With over 70 funded projects students are experiencing a range of roles in staff recruitment, leadership development and governance, ‘breaking down them and us approach’. BCU have an institution-wide commitment to student engagement and partnership working – this is led from the executive and is embedded within their mission and vision. This is a similar approach to the University of Lincoln and you can read more about their institution wide approach here. You can view a short video clip of students from BCU and University of Lincoln speaking about the benefits they have realised working on partnership projects. The afternoon plenary session had an inspirational presentation from Professor Rama Thirunamachandran, Vice-Chancellor and Principal, Canterbury Christ Church University on How can student feedback shape a university’s strategy? • Learning and teaching strategy (holistic approach) – the strategy was co-designed, the student communication strategy is being co-designed and implemented by students. • Assessment and reassessment, boards of examiners, strategic review and redesign – co-creators of the sector reviews, literature review and members of the institution’s task and finish group. • Estates master plan – Student Union president is a member of the international visits team and a full member of the master plan board supporting the redevelopment of the estates provision. • Process improvement programme – students are working with staff to reengineer major processes and systems and repositioning of services to enhance the student experience. 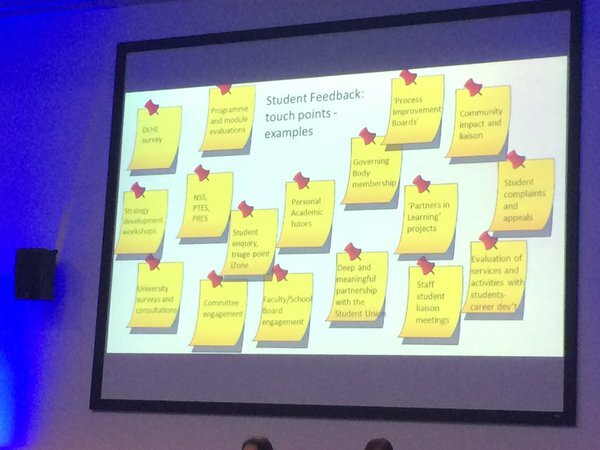 Professor Thirunamachandran also spoke about the need to gather, analyse and triangulate student feedback and data. The potential of learning analytics and services like the Digital Student data service are key to supporting institutions to make better use of the data they collect and to inform their strategic decisions. The workshop I ran on How Student partnerships are driving institutional change was an opportunity to share the key findings from our work on the Change Agents’ Network together with highlighting the excellent institutional examples of practice from the University of Lincoln, Birmingham City University, UCL and University of Southampton. I went away from this conference inspired and excited that senior leaders are realising the value of student partnerships as an approach to underpin their student engagement activities including in the development of the digital. Posted by Sarah Knight on December 10, 2015 in Uncategorized.